I don’t recommend that many books and the one’s that I do must be either a comprehensive treatment of a subject or one that has specific techniques fully outlined. Eric Maisel’s book is both. Maisel turns his psychologist/writer skills to the study of our unconscious and when it is doing it’s freest work, while we are sleeping. Among its many duties and capabilities is to do what Maisel calls, sleep thinking. We are already familiar with sleep thinking. “Give me some time to sleep on it,” is a common approach to decision making. We know that some how, during our sleeping, a part of our brain will work away and make our options clearer by morning. This behind the scenes work is different than studying our dreams. 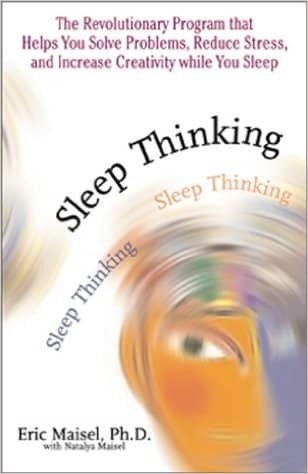 Sleep thinking is more to the point and sticks with what we are most concerned about. It isn’t overly poetic in what it shows us and sleep thinking results are more practical. Eric Maisel is a precise man. His book is not filled fluff. He jumps in provides the step-by-step approach to sleep thinking and then offers specific directions for common areas of interest such as building creativity, removing inner obstacles, and finding solutions to large challenges. The only special note I have about this book is this suggestion: start off easy and simple. Read the first chapters and then get down to work. Ask for insight or answers to something important to you and work that for a few days/a week. Repeat for another week or so. Don’t get bogged down when starting a sleep thinking practice by taking on too much. Get the principal down and do some preliminary work. Then, if called, jump back into Maisel’s detailed work program. This book is out-of-print but is still available ($1.00 to $4.00) so get it while you can. Here is the Amazon link.